Austin Community College District has set the goal of becoming a Zero Waste by 2040. Zero Waste is at least 90% diversion from landfills by reducing the amount of materials discarded through recycling, composting, and reducing the amount of waste generated. Be fashionable and eco-friendly with the 2019 ACC Eco Bag designed by Eco Bag Student Design Competition Winner, Melanie Sutherland. 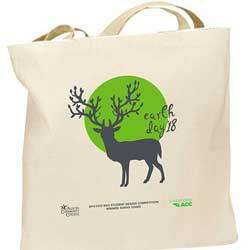 Eco Bags can be purchased for $2.49 each (plus tax) through the ACC Marketplace. These are available for pick-up at your Campus Manager's Office. Ordering for your ACC Department? Contact green@austincc.edu before ordering to purchase tax-free. Submit your original design when the contest opens to the 2020 ACC Eco Bag Art Contest. Win an e-reader and your design displayed on a reusable bag at each campus and sold on the ACC website for one year. To see past year's winning designs click here. Fill out the Zero Waste Event Form - Our staff will send you the Zero Waste Event Guide. Order compostable supplies for your event or contact your food vendor for compostable packaging options. We recruit volunteers for your event. On the day of the event we arrive with compost bins and educational signage. Austin Community College's Office of Energy and Sustainability and Service Center Mail Room collect surplus office supplies to distribute across the district for reuse. We currently have paperclips, rubberbands, and restored dry erase markers available. Fill out a form to request surplus office supplies. Recycling in the United States can divert more than 60 million tons of waste away from landfills every year. That amounts to about 32 percent of all of our garbage. Do your part by dropping recyclable items in the blue bins on campus. ACC is improving recycling campus-by-campus. Learn more about ACC's Recycling Improvement Program. Please rinse food waste off before recycling any of the following. *We do not recycle plastic bags. Please bring your plastic bags to your local grocery store to recycle. The Marker & Pen Recycling pilot was first launched at Highland Campus in 2018. The Marker & Pen Recycling Collection is located next to the Highland Campus Information Desk. The Office of Energy & Sustainability will expand Marker & Pen Recycling across the District during Earth Week 2019. Styrofoam packing cube recycling is available at all campuses in mesh collection bags. *Please DO NOT put packing peanuts, food containers, plastic bags, or spongy foam (LDPE #4) in the mesh collection bags. Please ask your campus administration to direct you to the collection point. Electronic Waste collection is available at all campuses. Please ask your campus administration to direct you to the collection point. ACC's FashionIncubator saves fabric scraps from their daily operations for recycling. These fabric scraps are sorted and sent to a third party for recycling and reuse as wiping rags. ACC has implemented Paper Towel Composting in restrooms across the district (coming soon to Elgin and Round Rock Campuses). Please put paper towels only in the marked bins, and NO food waste, recycling, or landfill waste. In order to abide by the City of Austin's Universal Recycling Ordinance and reduce the amount of waste ACC sends to landfills, ACC's cafe kitchens now compost food waste across the district. Eastview Campus' Culinary Arts Department diverts all compostable waste (inedible food from preparation and unfinished dishes) to compost bins within their kitchens. Eastview's Children's Lab School also teaches composting at a young age, providing bins for food waste and paper towels. ACC has installed Green Fountains on all campuses to decrease the number of single-use water bottles. Each fountain displays how many plastic bottles have been kept out of the landfill since its installation.